Ayurvedic medicine is the traditional medical system of India, originating five to ten thousand years ago. the truth is nobody known exactly. The word Ayurveda comes from Sanskrit, ayus meaning life and veda, knowledge. Simply put, Ayurveda is the knowledge or science of life. Ayurveda has a holistic approach to medicine, focusing on the whole person, mind and body. Spirituality and preventative lifestyle are crucial, with healthy eating playing an important role in the maintenance of the body (Watts). Ancient Indian history usually begins with the Harappan civilizations in Pakistan/northwest ancient India. The area thrived during the same time as the Old Kingdom in Egypt, so around 3500 BC, and lasted until 1700 BC. Two major cities were Harappa and Mohenjo-Daro, which were very congested cities. The cities had a sewage system, which was advanced for the time. They were also excellent breeding grounds for diseases, since people were in constant contact with other animals. Disease causing microorganisms on animals could no doubt have mutated to cause disease in humans as well. Sheldon Watts says, “Though the history of disease evolution is still very much in its infancy, preliminary conclusions tend to indicate a correlation between known inter-regional movements and the spread into Europe of new infectious killer diseases from India.” He gives an example of how malaria was not found in Greece until around the time Alexander the Great returned to the west from India (Watts). A few hundred years after the Harappan civilizations faded away, invaders, called the Aryans (calling themselves “the respectable ones”), swept into the subcontinent from northern lands. These people brought with them their Hindu religion. They spoke Sanskrit, and implemented the caste system, in which the Brahmins were the highest priestly caste. The first proto-doctors were a part of the merchant caste. Brahmins looked down upon them because proto-doctors appropriated the Brahmin sacred religious texts for their own use and took money for their services, which should have come out selfless care. But eventually the doctor profession did become solidified and excelled (Watts). The Aryans’ religious texts were the Vedas, or “the knowledge.” Two of them, the Rigveda and Atharvaveda, had parts devoted to diseases and cures. The knowledge from the books came straight from the gods, who sent them down to man to aid him (Pollack and Underwood). Since these texts were religious in nature, there was a inseparable connection between health and divine authority (Watts). The cause of sickness was usually demons. Proto-doctors would use medicinal plants and animal extracts for healing. Urine had a prominent place in this early Ayurvedic medicine, and sometimes proto-doctors would even drink urine (Watts). They became aware of diabetes, in which the urine tasted sweet. Ants were also attracted to sweet urine (Pickover). There are three main ancient Indian medical texts: The Charaka Samhita (named after the physician Charaka), the Sushruta Samhita (after Sushruta), and the Ashtanga Hridaya (by Vagbhata). These books cover a wide range of topics, including health and disease management, anatomy, physiology and pharmacology. Texts mention about 2000 drugs, 400 of mineral and animal origins, with the rest coming from plants . The Sushruta in particular was a strong surgical text. Dissection was religiously prohibited, so what they ended up doing was putting corpses in water for seven days. This would soften the tissues, and then the body would be rubbed by bark to expose the underlying organs. Surgeons would also use ants for suturing. When trying to close up a wound, ants would be induced to bite along the wound. Once bit, their bodies’ were cut off, so the ants acted liked clips. Surgeons were also able to do Caesarean sections on dead mothers (Pollack and Underwood). 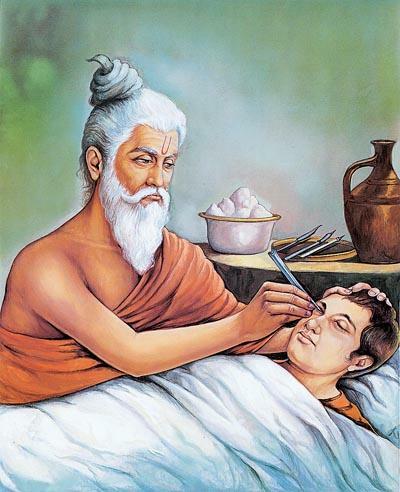 Sushruta, India’s first surgeon. Also did advanced plastic surgery. The inner working of Ayurvedic medicine come from Hindu/Buddhist philosophies. Spirituality is crucial for good health. There is a focus on the person, not the disease . Humans and the universe are made up of the same five elements. Earth (prithivi), air (vayu), water (jala), fire (agni) all exist within space (aakash) (Mukherjea). These five elements pair up and combine to create three doshas, humors , or energies so to speak. Vata, like wind, is responsible for the constant fluidity and movement within the body . Pitta, with heat and humidity, aids in transformation, creation, burning metabolism. Kapha is needed for stability, firmness, growth and maintenance. 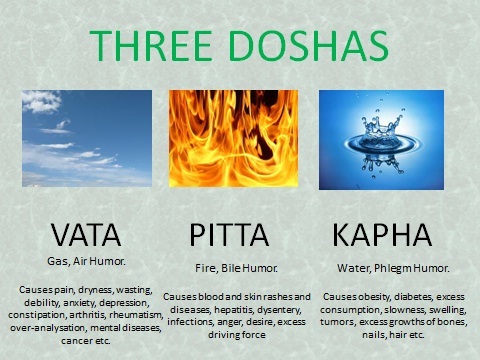 The doshas are the invisible forces working within the physical organ systems and what drives the processes without our bodies: breakdown, buildup and energy release (agni). When these doshas are out of balance, health deteriorates. Thus Ayurvedic medicine stresses upon balance within the mind, body, and consciousness. Each dosha has its own channels. Disease occurred when channels were overflowing or blocked, imbalance (Watts). When we eat food, two things can happen. Nutrients are used to create tissue or waste products (malas) are made. There are seven tissue types: plasma, blood, fat, bone, muscle, nerve, and reproductive tissue, and three malas (urine, feces, and sweat) . This reaffirms the notion that diet is very crucial to maintain balance, since food creates and sustains the body. There are four disease treatments, which use herbs and physical therapy. 1. Cleansing to remove toxins. Includes vomiting and blood letting. 2. Palliation to lessen pain. Includes fasting, yoga, and breathing exercises. 3. Rejuvenation, using herbal mixtures to revitalize and promote longevity and memory. 4. Spiritual healing, using recitations and meditations. Ayurveda is growing in India and around the world. Ayurveda includes eight major disciplines, including surgery, internal medicine, and psychiatry. India has the Department of Ayurveda, Yoga, and Naturopathy, Unani, Siddha, and Homeopathy (AYUSH) that oversees the regulation of the traditional medical systems in the country. Through the use of biomedical and chemical processes, Indian research institutions and schools have dedicated their effort to better understand Ayurvedic medicine, and to ensure its safety and efficacy.